The plug-in Post-Processor is defined in the Animator as either a universally applied process of every rendered frame or as an Actor that applies the effect over a range of frames in an animation. The Actor defined image processor can have its parameters morph over a range of frames. It is possible for multiple image processors to be applied one after the other in succession, each processor applies its effect to the image modified by any predecessor. The image processors can be very complex as they can gain access to the Software Renderer's depth buffer and thus an image processor could render a whole scene and blend it in with the OpenFX scene rendered in the usual way. This is how the atmospheric effect of volume fog is achieved. Access to the dept buffer ca also allow glowing effects, and lens flares to appear to go behind objects in the scene. The main structures that the post processors use is the output image buffer and the lights in the scene. The XIMAGE structure is defined in file "ximage.h" (located in the "common\postprocess" folder and the framebuffer and light's structure is defined in file "struct.h" which is located in the "postprocess" folder. Plug-in postprocessors (and shaders/animation effects) all have user configurable parameters. The number and type of the configurable parameters necessarily support different numbers of and different types of data. To be able to store these in the .MFX and .OFX files OpenFX stores these parameters as a text string - each plug-in is expected to begin by reading its parameters from the parameter text string (if it exists, or create it from defaults, if it does not exist.) In that part of the plug-in used by the Designer or Animator, before it terminates it is expected to write into the text string its parameters. This can normally be done using the C functions sscanf() and sprintf(). By adopting this strategy OpenFX imposes no constraints on the type or number of shader (etc.) parameters. Each image postprocessor is built as a Windows DLL, it will have one or more C or C++ language source file, one or more project specific header files , a Visual Studio project file, a resource file (.RC) and a file with filename extension .XFX. The project will build to a .DLL of the same name as the XFX file. The build files can have any location, but the XFX and DLL files must be placed in the "POSTPROCESS" folder. The "struct.h" header is located in the "effects" folder and it defines the "fullscreenbuffer" and the "light" data structures. The file "ximage.h" defines a data structure, (XIMAGE) that gives the postprocessor access to the Renderer's internal data that could be useful in implementing a postprocess. (All lights and the screen buffers are accessed through the use of this header.) Before calling a postprocessor the Renderer fills an instance of the XIMAGE structure and passes it to the _RenderImageProcess() function which is the function in the post processor that implements the filter. The resource file (.RC) will contain a dialog box description to allow the processor's parameters to be set by the user. 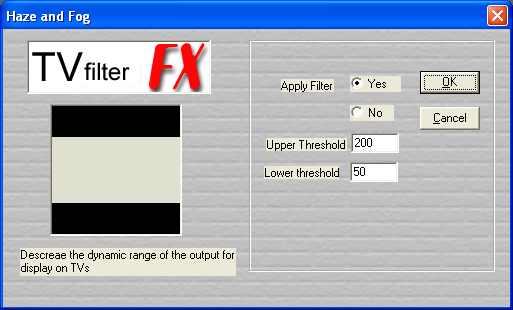 To get a feel for an image processor we shall look at a plugin for a simple filter that adjusts the dynamic range in the output image to make it suitable for display on TVs rather than a computer's monitor. these are located in the "postprocess" folder. The build project file is also located in the "postprocess" folder and there is a SLN file that includes all the image processor projects. The build process will create a DLL file called tv.dll in the postprocess folder. The wave.efx is a dummy file containing nothing, it is used for the external texture selection box to provide a list of all effects, it can be regarded as a simple place holder. If you want to start writing a new plugin then we suggest you copy the files from the example plugin to a new set. It's possible to copy the .VCPROJ files and modify it using notepad replacing all instances of the string "TV" with the name of your new texture. The DEF.DEF file is common to all postprocessors and it identifies all the functions in the postprocessor that are exported for use in the Animator and the Renderer. The plugin code follows the basic design of a Windows DLL . In this section we will examine the parts of the source file that are common to all postprocessor plugins. The most important items to be aware of are the names of the functions called by OpenFX's modules. These functions use pointers to data structures through which access to the OpenFX main module's (designer/animator/renderer) memory management, and other functions may be made. OpenFX uses a pointer mechanism for allowing the plugins to access functions in the main program and program global variables. Since all OpenFX plugins are DLLs that are loaded into the main applications address space. The plugin DLLs are NOT loaded when the main application starts (many of the built-in actions are also implemented as DLLs that ARE loaded when the program starts) they are loaded when required and unloaded when they have finished. The first parameter is a character pointer to the parameter string for the texture (this was mentioned above and we will render to it below. The second argument is a handle to the container's window. This handle is used in the generation of the modeless dialog box that allow the user to enter the image processor's parameters. The fourth parameter is a character string giving the name of the DLL supplying the effect. The Designer, Animator and Renderer keep only one copy of this structure, it is initialised at start-up and passed to all the plugins. By using the members of this structure any plugin can access the memory functions used internally. This method is very simple and very flexible for extension and allowing plug-ins to access global data and functions in the calling programs. Accessing variables and functions in a DLL module through direct use of a pointer to the X__MEMORY_MANAGER is very tiresome. For example to use the Designer's number of selected vertices variable (called "NvertSelect") it would be necessary to use the code ( (*(lpevi->NvertSelect)) ) to gain access to this variable. This is very messy! To overcome this issue and provide an interface to the functions that make them look (in the code) just like normal function calls, a number of #defines are included in the header file "defines.h" , which is one of the ".h" files that every plugin must include. Keeping this very important information in mind we can return to considering the Checker texture plugin and look at the key code constructs. Exported functions called by Renderer to process the output framebuffer.